Kunstraum Kreuzberg/Bethanien's facilities make medium sized shows possible. Around 6 exhibition projects are currently realized each year, partly in cooperation with other institutions and individuals. The exhibitions are accompanied by tours, films, debates and discussions with artists. We ourselves have only a very limited budget for this programme so that outside funding and partnerships are indispensable. 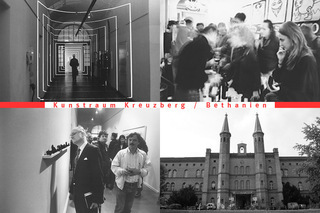 The Kunstraum Kreuzberg/Bethanien is an institution of the Kulturamt Friedrichhain-Kreuzberg (District Department of Culture). Bethanien was built as a hospital in 1847 on the orders of Friedrich-Wilhelm IV and designed by Theodor Stein. At the time the site still lay outside the city; the building continued to serve as a hospital until 1970. With the closure of the hospital in 1970, an intense 'struggle for Bethanien' began. Plans to demolish the building and replace it with social housing were countered through occupation, citizens’ initiatives and conservationists. Since then it has been mainly used by cultural and artistic institutions working in the main building. Besides the Kunstraum Kreuzberg/Bethanien these include the printing works of the BBK Berlin, the house for artists Künstlerhaus Bethanien GmbH, and the Friedrichshain Kreuzberg district music school. Stéphane Bauer has been the director of the Kunstraum Kreuzberg/Bethanien and responsible for its programme and organisation since 2002. He studied sociology and went on to work for the Federal Association of Student Cultural Work (Bundesverband Studentischer Kulturarbeit) in Bonn followed by an assistantship at the University of Arts Berlin (Hochschule der Künste) He has been managing director of the Kunstamt Kreuzberg (District Department of Culture) since July 1990. Stéphane Bauer has curated exhibitions in Berlin at the Kunstamt Kreuzberg and the Neue Gesellschaft für Bildende Künste since 1994.